Recently I scored an older version of this nifty little program, Pixarra Tree Brush Studio from Shareware On Sale. Shareware On Sale often features art-related and design tools from a variety of different companies, and are well worth following. 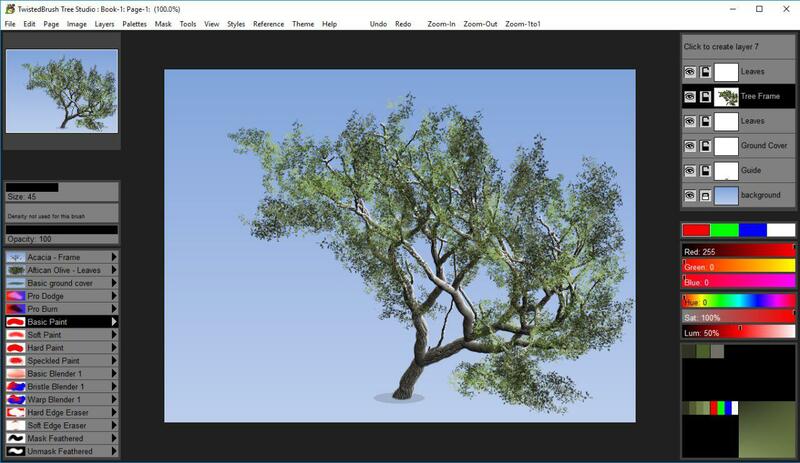 This program provides a variety of tree forms and shapes. You pick a trunk shape, then paint the leaves onto it so you have a unique tree you can add into your digital art or photos. It’s extremely easy to use, the interface is intuitive. There are additional tools to blend, paint, erase, mask and otherwise manipulate the image, which you can merge with your art or photos, or export for use in other programs. The final image isn’t photo-realistic, but it’s close enough (with a little manipulation) to fool many viewers. Definitely worth trying out.